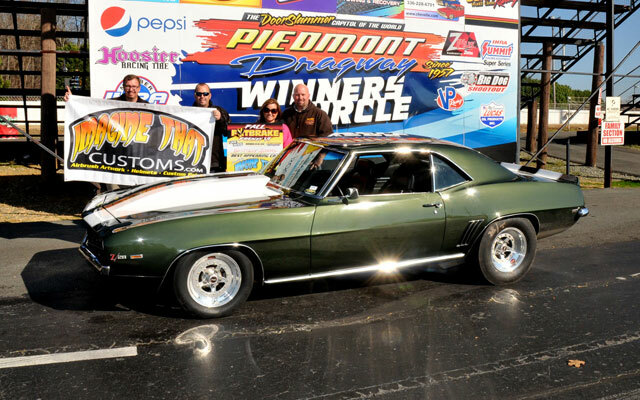 While Mother Nature turned a cold shoulder on the Fall Footbrake Frenzy VI initial kickoff at Piedmont Dragway in Julian, NC, warmer fortunes prevailed, and history was made on multiple fronts. 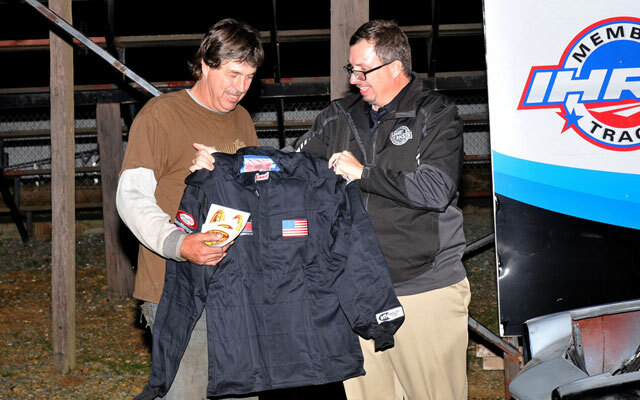 Friday’s Summit Racing Equipment $5K Warmup was cancelled due to steady temps below 40 degrees, but promoters Anthony Walton and Michael Beard of Loose Rocker stacked the $5K on top of Saturday’s NitroPlate $20K Main Event, along with all of the round money and prizes. Cold temps forced a similar combining of races last year, with Adam Davis of Eva, Ala. capturing Loose Rocker’s first $25,000 payday, but with the substantial purse increase offered this year, Saturday alone bulged with a staggering total cash payout of over $50,000! Because of the loss of Friday, the $50 weekend entry discount was offered to the $25K entrants, and buybacks were not raised at all, remaining at just $100. Third round winners received $300, with an additional $250 per round after that. 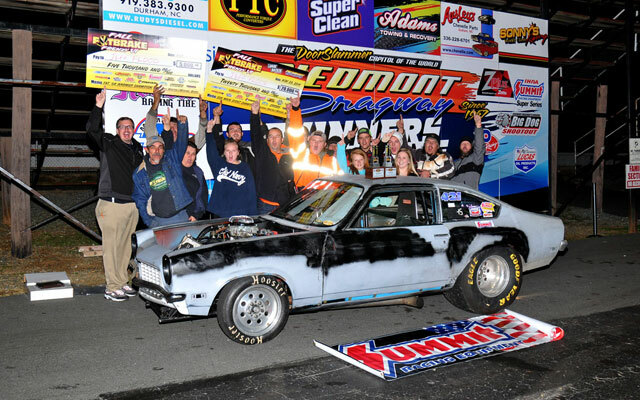 By the quarterfinals, those 216 cars in the Summit/NitroPlate $25K Main Event were whittled down to multi-time Loose Rocker Big Check winner Dave Dissinger, Bracket Finals Champions Ken Myrick and Jeff Flood, former $20K winner “Big Bucks” Bob Mullaney, and multi-time Race of Champions and World Footbrake Challenge winner Steve Alford. Alford advanced to the semis with the bye run. Flood beat Myrick, and Mullaney dispatched Dissinger, each on the strength of a holeshot. 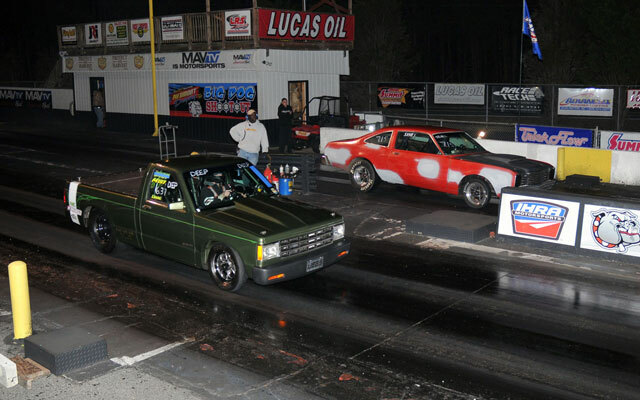 In the semis, Flood overcame Alford’s .016 to .027 reaction time advantage when Alford dropped to get behind him, leaving Flood to take a 6.422 (6.39 dial-in) to 6.723 (6.67) win. 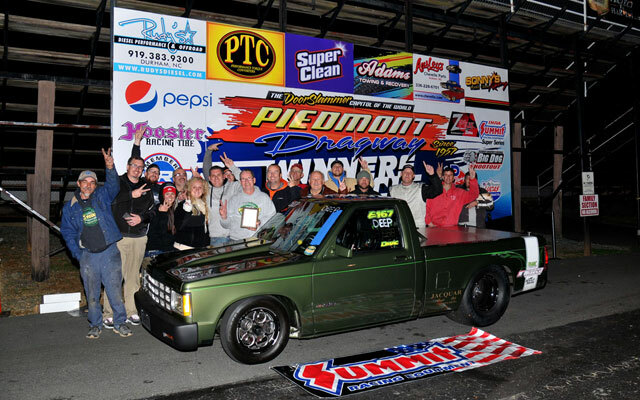 Mullaney, from Rockaway, NJ, drove the clean green S-10 owned by another WFC champ, Denny Maclosky, and rolled into the finals on the bye. If anyone in the betting crowd put their dollars on paint, they were quickly schooled. Jeff Flood’s Farmington, NC-based Vega has always been a primered workhorse, the furthest thing from any showpiece. 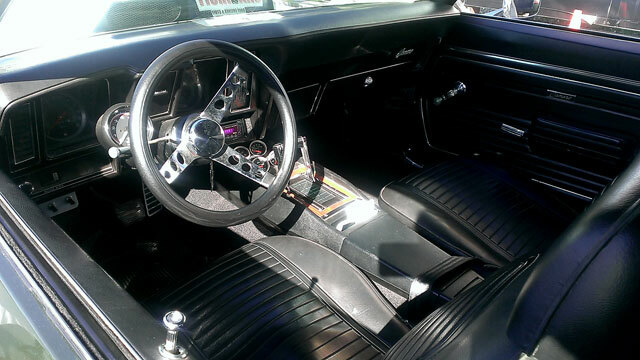 It had recently suffered a ride on the guardrail, so it was even sporting some new primer, but none of that has any bearing on the inner workings of the car itself or the long-proven skill of the driver. 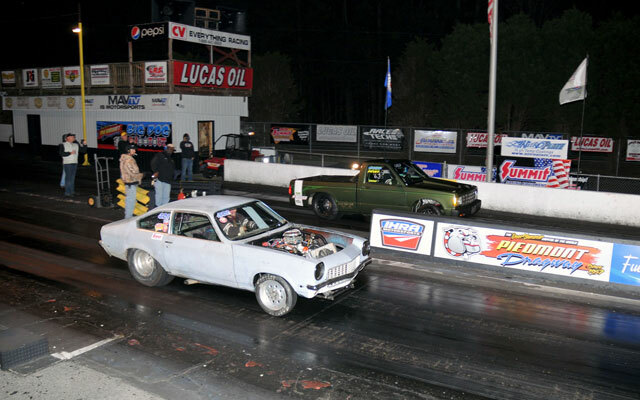 Flood virtually sealed the deal at the start with an .014 to .049 holeshot, grabbing the win light with a 6.422 (6.39) for the biggest win of his career, against Mullaney’s dead-on 6.356 drop. 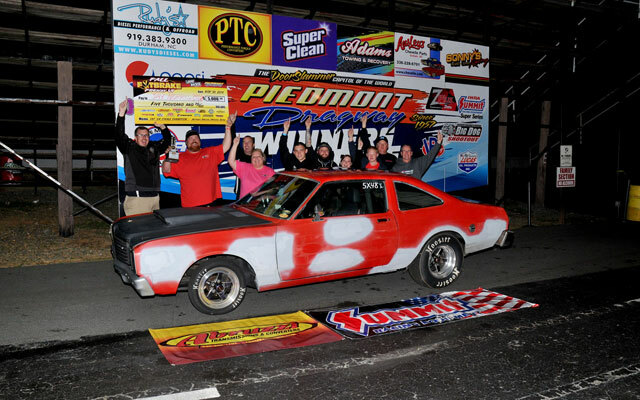 Sunday’s Abruzzi Racing Transmissions & Converters FAT $5K Finale was also bursting at the seams with money, prizes, and talented drivers comprising 192 entries. In the fourth round, an amazing seven drivers were still double-entered, including Jared Bargo, Ernie Humes, Jay Norris, Derek Harris, Terry Rucker, and twins William Roberts and Wesley Roberts. By the quarterfinals, however, only Norris still held two entries. 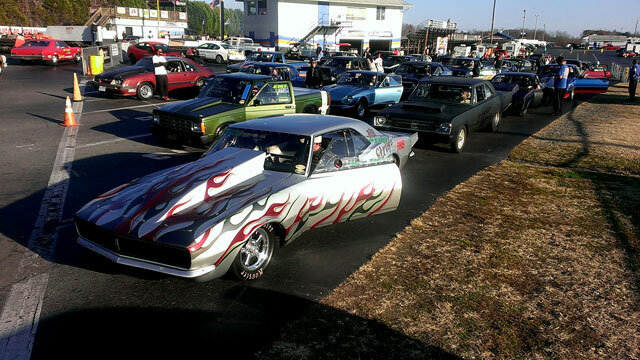 The Campobello, SC-based Dodge Aspen that Norris has footbraked to Top ET wins, numerous Greer Dragway track championships, and number two in the 2013 IHRA Summit No-Box World Championship program wasn’t in its prettiest state, with all the decals stripped, and plenty of primer as Norris prepares to paint it this winter. After Flood’s $25K feat and the drubbing that Norris had been handing out all day, no one cared what the car looked like anymore! Norris’s .022-backed dead-on 7.153 got in on David Smith Jr.’s big wheelstanding Duster on his first entry, dropping Smith’s otherwise solid .029 and 5.920 (5.91). 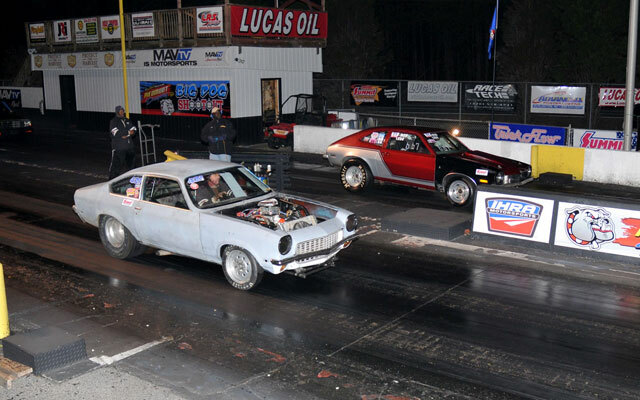 On his second entry, Norris repeated his performance against Wesley Roberts in another brutally close race, taking the win with an .027 and dead-on 7.154 to Roberts’ .039 and 5.890 (5.88). 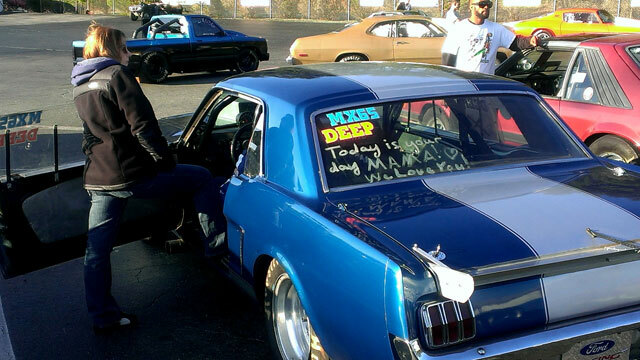 Saturday’s runner-up Bob Mullaney was back in the mix once again, riding the bye to the semis. Norris held two entries at three cars, placed in the rare position to potentially run himself in the finals. He had the bye to the finals with one entry, and was paired with Mullaney on the other. In order to win the race, Mullaney would have to beat Norris not once, but twice! Announcer Ron Huntley, Jr. dubbed Norris the “Double Dragon” as they pulled into the burnout box. Norris extended his handicapped start with an .014 to .032 holeshot. Mullaney dropped dead-on once again, 6.374 (6.37), but ended up behind Norris’s 7.165 (7.15). With only Norris and himself remaining, it was over! Norris earned his way by running dead-on six times, including four straight dead-on 7.15’s, and had nine reaction times from .003 to .018. 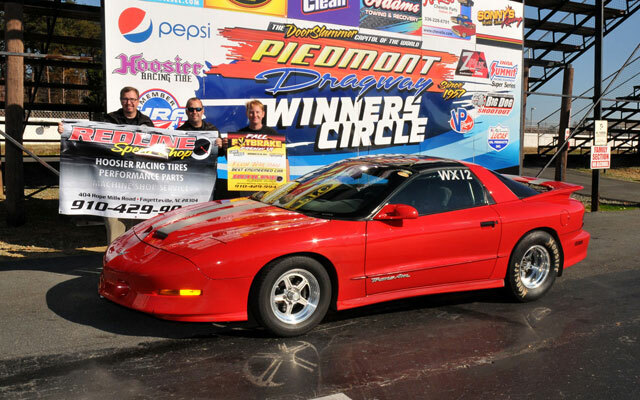 He took home not only the winner and runner-up money, but also an Abruzzi Racing Torque Converter, a Summit Racing Equipment firejacket and stack of gift cards, as well as NitroPlate Bye Run Awards. 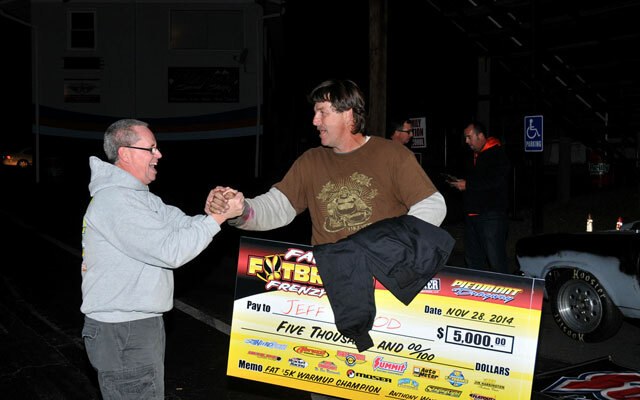 All told, Norris’s haul in the $5K Finale totaled over $8,000 in cash and prizes! “I want to thank Rhonda Norris who kept me pointed the right way all day, and Paul Mosley and Robert Bryan for all the help. Can’t run a heap that many rounds without good stuff!” he concluded. 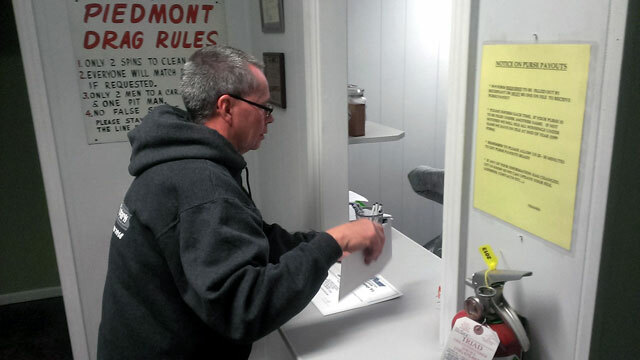 Auto Meter $250 gift certificate: Dave Harvey, Jr. 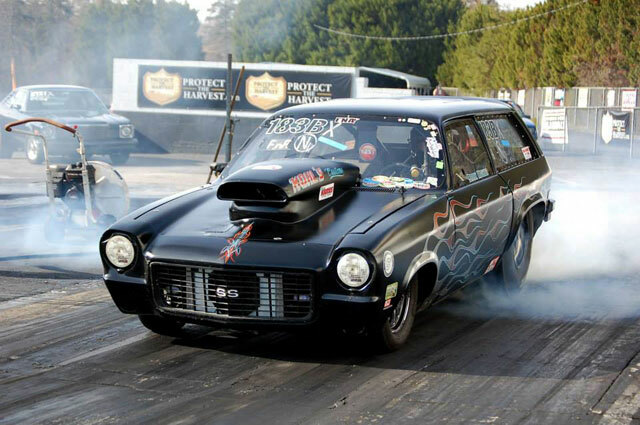 Loose Rocker returns to Piedmont Dragway for the Thanksgiving Tradition once again for the Fall Footbrake Frenzy VII, November 27-29, 2015. For the complete 2015 Loose Rocker schedule and more results, photos, video, news, and entertainment, “like” Loose Rocker on Facebook, or visit www.looserocker.com.